Calls, like email, are an efficient means of communication. Making manual phone calls and keeping numbers in sheets is far from being efficient; numbers can be lost, or destroyed easily if kept in sheets of paper. We at Flexie understand the huge importance of having a solid communication platform, that’s why we’ve come up with a platform. Make and receive phone calls directly from Flexie’s browser. The days when you had to reach out for the phone to call potential customers, business partners and random contacts are long gone. After all, why reach out for the phone when you can call directly from within your browser? With Flexie, you no longer have to waste time using sheets of paper or reaching out to the phone. You can make and receive calls from Flexie without ever leaving the CRM. Simple-to-use and incredibly efficient. 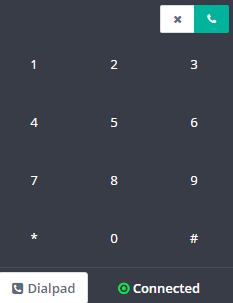 To make phone calls directly from Flexie, all you have to do is click on the call icon. You can also make manual calls directly from the Dialpad. You no longer need to worry about the compatibility of our VoIP with your browser, since Flexie’s VoIP integration is compatible with all major browsers. You can make and receive calls at any time, from anywhere- directly from Flexie. With Flexie, no information will ever fall between the cracks. Our CRM keeps a call log for you, so that you keep close track of every conversation.